Most people think that “(What’s So Funny About) Peace, Love & Understanding” is an Elvis Costello song, but in fact it was written by Nick Lowe back in 1974, when he was a member of the pub-rock band Brinsley Schwarz. Elvis’s version is all well and good but, hipster snob that I am, I prefer the original. After putting it on a mix that I made, I heard it several times this week, and it got better each time; it has not aged a day in 43 years, and is perhaps more relevant and more necessary today than it ever has been. And even that was way down the page, below EC, several Lowe solo renditions, and covers by Bruce Springsteen, Audioslave, and A Perfect Circle. The latter are actually second-degree covers: covers of Elvis’s cover, not that there’s anything wrong with that. “What’s So Funny” has also been done by everyone from Wilco, Natalie Merchant, and the Wallflowers to the Flaming Lips, Midnight Oil, and of course Trip Shakespeare. Oh, and let us not forget, Bill Murray. Peace and love, everybody. 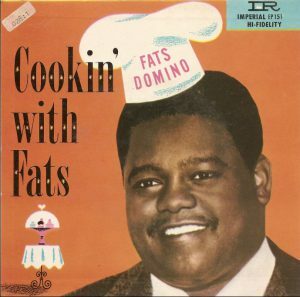 News came over the transom today of the death of the great Antoine “Fats” Domino, making him the second rock’n’roll Founding Father to pass on this year (after Chuck Berry, DOD 3/18/2017). But you never know…Richard was on deathwatch last year, but rallied and is still making the rounds. Hopefully they will both stick around for awhile; it will be a sad day indeed when rock’s dinosaurs no longer walk the Earth.